As The Walking Dead cruises through its seventh season, the deadliest villain of all has arrived and will be wreaking havoc throughout Alexandria. 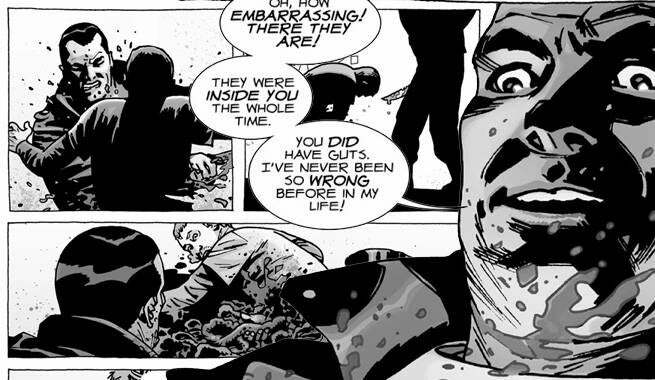 For some characters, the writing may be on the wall given the events of Robert Kirkman's original Walking Dead comics - just ask Glenn. With Negan heading to Alexandria in Sunday's new episode of The Walking Dead, many fans are expecting to see another iconic death ripped straight from the pages and plastered onto our TV screens. They're talking about Spencer Monroe and the "guts" scene. Speaking to Spencer actor Austin Nichols ahead of the new episode, ComicBook.com heard the actor's perspective of Spencer's death. Luckily for him, if the scene should come, he will be warned prior to finding out by reading the script. "They're supposed to tell people in advance," Nichols said. "The funny thing about that is I've heard horror stories of that happening on other shows and an actors reads and finds out. That's really cruel and I hope that doesn't happen on our show." "The hope is is that our bosses would give us some warning," Nichols said. "We literally move our lives to Atlanta and find places to live. It's a little bit more complicated than just reading a script and finding out that you're dying." That said, Nichols admits he does have hope to see Spencer's iconic death realized in live-action form, despite knowing it would mean he is out of a job with The Walking Dead. "Here's the thing, I remember reading the comics and going, 'Oh, my god. That death is f---ing awesome,'" Nichols said. "I sure hope he doesn't die, but everybody does eventually. If that was his death I think I'd be pretty proud of that death - a pretty cool death by Negan. I don't want to leave yet. I really love the job, I love the show and I'd love to stay as long as I can."